Arjun Kapoor will be seen playing the role of an intelligent officer in the upcoming film, India’s Most Wanted. The film directed by Raj Kumar Gupta is inspired by true events. It is the story of unsung heroics of five men who managed to hunt down the nation’s Osama without firing a bullet. And this manhunt operation saved lives of billion people. The makers of India’s Most Wanted have shared a new poster in which Arjun is seen on a mission. India’s Most Wanted Poster: Arjun Kapoor Intrigues Us With His Partly Obscured Face (View Pic). Makers of India’s Most Wanted will share the film’s teaser today (April 16) noon. Those faceless motion poster and partly obscured face poster of Arjun Kapoor, has already created curiosity amongst the movie buffs. The excitement to know what is in store is quite high. The tagline of this new poster reads, “No Guns… No Glory… Only Guts”. While sharing the poster, Arjun captioned it, “Inspired by true events, #IndiasMostWanted is a story of guts & pride. It's about the 5 men who save the lives of a billion people by hunting down India's Osama. 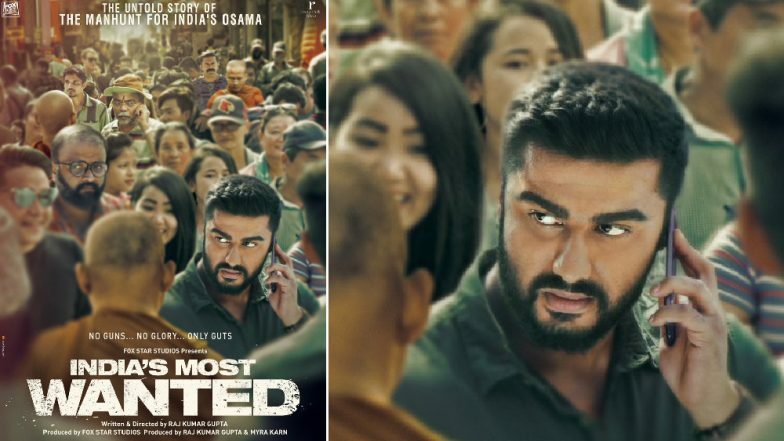 Teaser out at noon today.” India's Most Wanted: Arjun Kapoor Shows Us 'The Face of Terror' of India's Osama in the New Motion Poster (Watch Video). Last November as the film wrapped up, Arjun Kapoor shared a post that read, “Some journeys are special because of the team and the effort that the people put in to fulfil a vision... As my 12th film India's Most Wanted wraps today, all I can say is Raj Kumar Gupta, it's been an honour and a privilege to work with you and your team, to tell a story that needed to be told and to play one of the many unsung heroes we have in our country.” India’s Most Wanted is all set to hit the big screens on May 24.